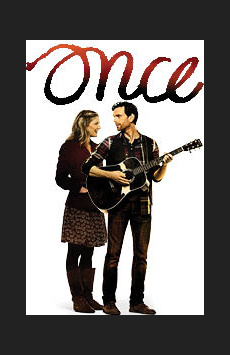 What Is the story of Once? Guy is an Irish singer and songwriter who spends his days fixing vacuums in the Dublin shop he runs with his father, and his nights playing his music in local pubs. He is on the verge of giving up music altogether when a Czech immigrant, “Girl,” walks into the bar, hears him play and refuses to let him abandon his guitar. As it turns out, she has a broken vacuum cleaner, Guty repairs it, and she pays him in music on a piano she plays in a record shop. Over the course of a week, Girl convinces Guy to believe in the power of his music and his love for the woman who inspired his songs. They scrape together money to record a demo album with a motley crew of bar friends, and their unexpected friendship and collaboration evolves into a powerful—but very complicated—love story.